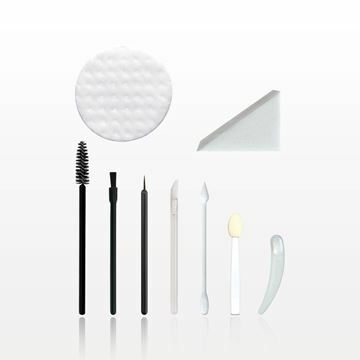 Replenish our beauty makeover kit (Part # 522105) with this refill that contains point/flat tip swabs, eye shadow and lip gloss applicators, lip and eye liner brushes, mascara wands, boomerang spatulas, a latex-free sponge block and round embossed cotton pads. Flawlessly apply liquid makeup to the skin and easily reach facial contours with our purple mini oblong blending sponge and pink slanted sponge tip applicator brush. Use the sponges wet or dry to achieve your desired effect. These items come packaged together in a clear box with retail hang tab. To clean, wet sponge in cold or lukewarm water. Apply a small amount of facial cleanser, antibacterial liquid soap or sponge cleanser to the stained areas. Gently work into a lather without twisting or stretching the sponge. Rinse and repeat if necessary. Squeeze to remove excess water. Set aside on a piece of paper towel to dry. With the professional nail tech in mind, this well-organized deluxe nail supply kit is completely stocked with basic nail care essentials. 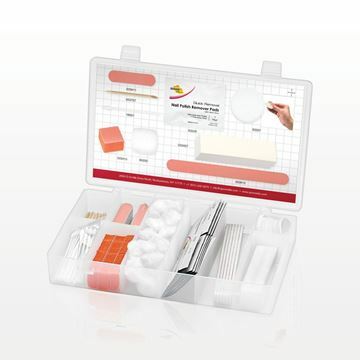 This kit includes 12 Point/Bevel Tips Manicure Sticks, 20 Cuticle Pusher/Nail Care Swabs, 12 Mini Nail Files, 6 Regular Nail Files, 1 White Buffing Block, 9 Orange Mini Buffing Blocks, 20 Large Cotton Balls, 10 Diamond Wipes Acetone Nail Polish Remover Pads and 10 Protective Lint Free Cosmetic Pads. The supplies lay nicely inside this 10.5 inch x 6.19 inch x 1.56 inch beauty supply organizer with adjustable partitions. The lid seals with two clasps to keep items secure during travel. All products in this kit are sold separately for refill purposes. With the professional makeup artist in mind, this well-organized essential makeover supply kit contains all the necessary disposable makeup applicators to a hygienic environment for clients. The supplies lay nicely inside this 10.5 inch x 6.19 inch x 1.56 inch beauty supply organizer with adjustable partitions. The lid seals with two clasps to keep items from spilling during travel and making it is easy to store. This kit includes a sharpener, point/flat tip swabs, eye shadow and lip gloss applicators, lip and eye liner brushes, mascara wands, boomerang spatulas, a latex-free sponge block and round embossed cotton pads. We also offer a convenient refill pack to replenish the kit (Part # 522106). Developed exclusively with THE MAKEUP SHOW, this well-organized makeover supply kit is a must-have for any professional makeup artist. It contains all the necessary disposable applicators to maintain a hygienic environment for clients. The supplies lay nicely inside this 10.5 inch x 6.19 inch x 1.56 inch organizer with adjustable partitions. The lid seals with two clasps to keep items from spilling during travel and making it is easy to store. This kit includes two sharpeners, point/flat tip swabs, eye shadow and lip gloss applicators, lip brushes, mascara wands, boomerang spatulas, pointed scissors, a latex-free sponge block and rectangular cotton pads. Qosmedix offers the widest variety of disposable applicators in the beauty industry. We simplify the buying process by offering a complete makeover supply applicator kit stocked with all the necessary disposables professional makeup artists use when performing makeovers on their clients. This portable applicator kit features high quality supplies in a convenient organizer. Our well-stocked applicator kits include cosmetic swabs, makeup applicators, lipstick brushes, mascara wands, disposable spatulas, cotton pads, spatulas and sponges. 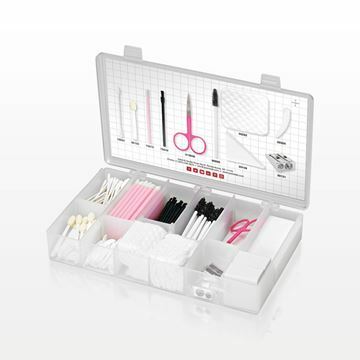 The interior design of our makeover supply kit allows for optimal organization of the enclosed contents. The dividing partitions can be adjusted as necessary. The lid seals with two clasps to keep items from spilling during travel and making it easy to store. Refills are also available for purchase. It is everything a professional makeup artist needs to stay organized and ensure hygienic makeup application. A Qosmedix exclusive, the Makeover Supply Kit is a favorite of celebrity makeup artists and beauty school students worldwide. Our disposable Tester Kit offers convenience to beauty retailers, cosmetic companies, independent consultants or anyone offering sampling and testing of cosmetics products. Already pre-packaged, our Tester Kit features a triangular wedge sponge, lipstick tester spatula, eye shadow applicator, lip brush and mascara wand all conveniently enclosed inside a clear zipper bag. In addition to our Tester Kits, we also offer a professional Makeover Supply Kit, which includes an array of disposable cosmetic applicators in a portable organizer. Always use disposable cosmetic applicators to help decrease the risk of cross-contamination.